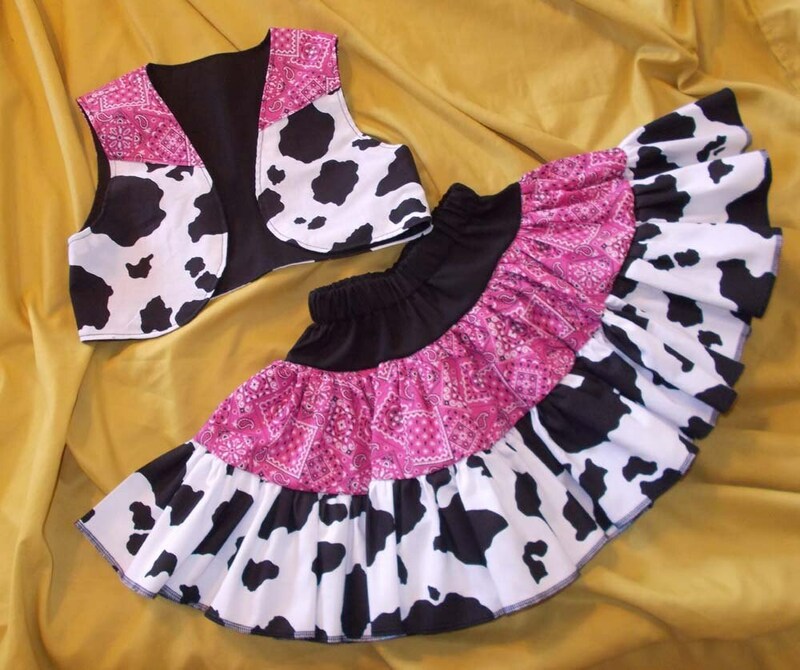 Cute Cowgirl Ruffled Twirly Skirt and Vest Set in Hot Pink Sizes Infant 12M to Toddler & Girl's Size 16. A cute little cowgirl vest and fun and full ruffled 100% cotton cowgirl skirt with hot pink bandana and black and white cow print fabrics. Double tiered skirt is made extra full for your little girl's twirling fun. Perfect for any cowgirl's wardrobe.Also available in other colors: Pink Bandana, Red Bandana, Hot Pink Bandana, Lime Bandana, Turquoise Bandana and Purple Bandana. Cute Cowgirl Ruffled Twirly Skirt and Vest Set in Light Pink Sizes Infant 12M to Toddler & Girl's Size 16.